To schedule any of the required inspections outlined under the "Inspection Types" tab, please call (302) 858-5500. Inspection requests received between 7:30 a.m. and 3 p.m. Monday through Friday (excluding holidays) will be scheduled for the next business day. Before calling to schedule an inspection, please have the following information ready: project application number, 911 address, contact name and telephone number, and preferred inspection date. The Building Code office will make every effort to schedule requests as quickly as possible. On the day of the scheduled inspection, a County inspector will notify the contact person with an approximate appointment time prior to arriving on site. Please note, there may be days inspections will not be performed due to inclement weather, meetings, training, or other factors. On any of these days, requested inspections will be scheduled for the next business day. Those requesting inspections are asked to give the Building Code Inspection Office at least 24 hours' notice in advance of a requested inspection date/time. If you have any questions, please contact the Building Code Inspection Office at (302) 858-5500. County-approved plans must be on site and accessible to the building inspector for a project to receive an inspection. Also, all pre-engineered products and building components, including, but not limited to, trusses and Delaware-stamped specs; I-joists; and structural, composite, lumber, and steel beams; must have certification from their manufacturer and be on site for inspectors’ review. Failure to provide County-approve plans or manufacturer’s specifications will result in a failed inspection. All third-party inspections such as, but not limited to, engineered footing reports; water proofing certifications; pre-drywall insulation/energy reports; pre-engineered truss repairs; and final energy reports, etc., must be provided to the Building Code Inspection Office prior to scheduling any inspections. At the time of inspection, a building inspector will leave a blue sticker on a window or in the building’s electrical panel box for a passed inspection. The blue sticker will have the project’s application number, the inspector’s initials, the date, and type of inspection. In the event an the inspection fails, the contact person on file will receive notification of what item(s) failed. After final inspections, the issuance of a certificate of occupancy (CO) may take up to 48 hours to process. If the project is located within a municipality that Sussex County Building Code serves, the certificate of occupancy will be sent to the property owner on file. If the project is in the County’s unincorporated area, the County Planning & Zoning Office will issue the certificate of occupancy/compliance. If your project is outside a municipality in unincorporated Sussex County, please contact the County's Planning & Zoning Office at (302) 855-7878 to obtain that officer's requirements. You may also obtain status information for all inspections by utilizing the Self Service Portal located on the County’s website. You can gain access either by entering the Parcel ID or the project's application number. To be made prior to placing concrete in all forms, trenches, piers, post holes, structural slabs, etc. Bottom of all footings must be a minimum of 24” inches below finished grade and a minimum 12” inches below original grade, (pole buildings must be a minimum 36” inches below grade) unless designed by a Delaware architect or engineer. Any re-bar and reinforcement must be tied and in place before placement of concrete. Re-bar is recommended, but not required, unless designed by a Delaware architect or engineer. All footings must be free of debris, organic material and water. Concrete shall not be placed on frozen soil. *** A separate inspection for perimeter or under slab insulation board for "pole building" style dwellings or dwellings with a monolithic turn down slab or slab on grade foundation is required. To be made after building is weather tight and after all electrical and plumbing work has been installed and inspected. All mechanical ducts and boots must be installed and sealed. All draft stopping and fire blocking around pipes, vents, wiring, chimneys, etc., must be completed. Framing inspection to be conducted before exterior covering is installed. No insulation is to be installed before framing inspection passes. Basement waterproofing must be complete and certification must be provided to the Building Code Office, prior to scheduling the inspection. All pre-engineered products and building components, including, but not limited to, trusses; I-joists; and structural, composite, lumber, and steel beams; must have certification from manufacturer and be on site for inspector review. Pole buildings require a framing inspection for header connectors prior to any exterior or interior wall covering is installed. Plant-built portions of modular homes do not require a framing inspection, but are required a "Close-In" inspection after the units are set and before mating walls have exterior covering installed. Any site-built portions of a modular home project are still required a framing inspection. Copy of the energy compliance form ("Res-Check") must be on site. Before any drywall is installed, the building envelope must be sealed from all air drafts and all insulation properly installed. All thermal stickers for doors and windows must be in place. (Modular homes to have all air gaps in mating walls sealed and any site-built portion such as: finished Cape Cods, rooms over garages, additional living spaces, etc.) As of 11/11/2014, all new homes must have a blower door/duct blast test certification and a permanent certificate must be completed and posted in or around the electric box before final inspection. County-approved plans must be kept on job site for inspector's review to receive an inspection. To be made after building is weather tight and after all electrical and plumbing work has been installed and inspected. All mechanical ducts and boots must be installed and sealed. All draft stopping and fire blocking around pipes, vents, wiring, chimneys, etc., must be completed. Framing inspection to be conducted before exterior covering is installed. No insulation is to be installed before framing inspection passes. Basement waterproofing must be complete and certification must be provided to the Building Code Office, prior to scheduling the inspection. All pre-engineered products and building components, including but not limited to, trusses; I-joists; and structural, composite, lumber, and steel beams; must have certification from manufacturer and be on site for inspector review. Pole buildings require a framing inspection for header connections prior to any exterior or interior wall covering to be installed. To be made prior to placing concrete in all footings, trenches, piers, post holes, structural slabs, etc. All reinforcement must be tied and in place. All footings must be free of debris, organic material and water. Concrete shall not be placed on frozen soil. In cold weather pours, insulating or thermal blankets must be on site to protect from freezing. To be made after the roof, all framing, bracing, & draft/fire stopping is in place. All pipes, chimneys/chases, electrical wiring and vents are complete and before any insulation is installed. Framing inspection to be conducted before exterior covering is installed to verify building wrap, door & window flashing is installed properly. Rough electrical and plumbing inspections must be received and approvals must be on site before scheduling a framing inspection. To be made after the building/project is completed, stocked and ready for occupancy. All final inspections as required for electrical, plumbing, fire marshal, Del-Dot, etc. must be received and approvals must be on site before scheduling a final inspection. COUNTY APPROVED PLANS TO BE KEPT ON JOB SITE. (302) 858-5500 BETWEEN 7:30 A.M. & 3:00 P.M.
MUST HAVE APPLICATION NUMBER TO SCHEDULE INSPECTIONS. All single-family projects will receive up to five (5) inspections, except modular home projects without additions. Modular home projects without additions will receive four (4) inspections. Any additional inspections after five inspections (except modular home projects without site-built additions) shall be charged $40.00 per trip, which is to be paid before the issuance of the certificate of occupancy (CO). Modular home projects will be charged $40.00 per trip after four inspections. 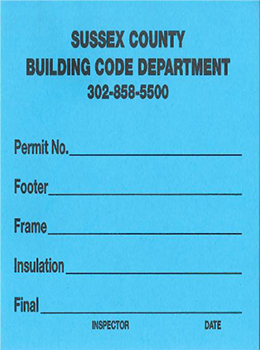 The Building Code Inspections Office is responsible for scheduling and coordinating building inspections for all single-family, commercial, and multi-family projects in unincorporated Sussex County and certain municipalities (See list of towns). The Inspections Office operates 7:30 a.m. to 3:30 p.m. Monday through Friday (excluding holidays). You may also obtain status information for all inspections by utilizing the Self Service Portal. You can gain access either by entering the Parcel ID or the project’s application number.